The Montoya-Alcocer Family. Josue Alcocer is a 2017 John O’Connell High School graduate. He is now attending City College. 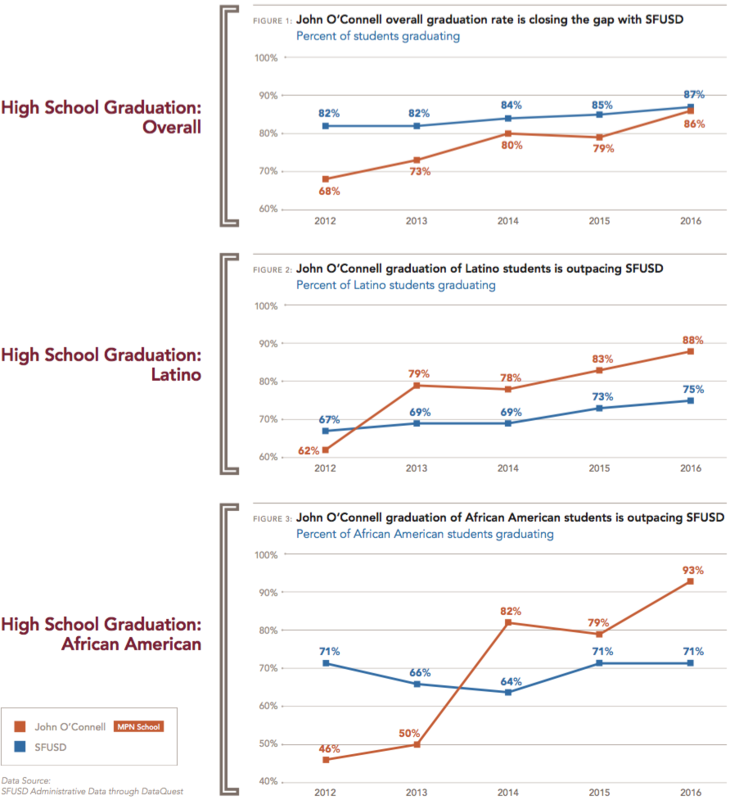 There is some great news coming out of John O’Connell High School: Graduation rates have increased, with Latino and African American students now graduating at higher rates than from the San Francisco Unified School District (SFUSD). 86 percent of students graduated in 2016 (just one percent shy of SFUSD’s overall rate). 88 percent of Latino students graduated in 2016 (compared to 75 percent of Latinos in SFUSD). 93 percent of African American students graduated in 2016 (22 percent higher than the rate for African Americans in SFUSD). These results occurred via a concerted effort, built over 15 years, with the final part of the equation the addition of the Mission Promise Neighborhood. This education initiative brought together 25+ community-based partners to engage in a collective struggle to overcome the predictive power of demographics. John O’Connell High School students arrive having faced disproportionate challenges of inequitable access to academic and economic opportunity. Fifty percent of students come with low attendance and GPAs in 8th grade, both early warning indicators. John O’Connell High School and the Mission Promise Neighborhood have jointly adopted a multidisciplinary co-teaching approach. Team co-planning and co-teaching among classroom teachers and partner program staff has enabled John O’Connell High School to support students’ academic and socio-emotional development, ultimately building a school culture that does not wait for students to struggle and instead helps students expeditiously reach their goals. Part of this strategy is harnessing the power of a trio of tried-and-true programs: SFUSD’s Mentoring for Success, Student Success Coaches and Mission Graduates’ college access program. Integrating supportive adults into the school day contributes to increases in feelings of safety and adult support among John O’Connell students. Additionally, the family success coach, community school coordinator and student success coach work daily to build a college-going culture, strengthening student and parent comfort levels with navigating what can be a daunting process. This is especially true of our newcomer parents, for whom the college requirement, application and financial aid processes are intimidating. Bettered graduation rates are an important piece of the cradle-to-college-to-career continuum on which our Mission Promise Neighborhood kids travel. And here’s another important number: In 2017, 76 percent of students at John O’Connell said they planned to attend a two- or four-year college after graduating. The Promise Neighborhood initiative was inspired by New York’s Harlem Children’s Zone Director Geoffrey Canada’s promise that every kid, no matter their background, had the capacity to do well in school and graduate. “In San Francisco, we are keeping the promise,” sums up Ryan. Great news: Thanks to partner strategies, mentorships and increased parent engagement, the graduation rate of John O’Connell High School is now approaching that of SFUSD overall. According to a recently published Mission Promise Neighborhood data brief, “Making College an Achievable Dream: Foundations and Results,” O’Connell’s graduation rate increased from 68 percent to 85 percent between 2012 and 2016. While O’Connell students desire to attain a college degree, how to pay for postsecondary education remains daunting, as the majority of students come from underresourced families. The same data brief reported that 51 percent of students at O’Connell indicated that financing is their main barrier to attending college. That was the impetus for the creation of the Mission Promise Neighborhood Scholarship Fund last year, with the community’s efforts translating to four deserving O’Connell seniors matriculating at colleges in fall 2016. Looking to further increase the Mission Promise Neighborhood Scholarship Fund’s impact was the goal for 2017, with MEDA Development Manager Alberto Galindo setting the goals and spearheading the strategies to make this happen. MEDA is the lead agency of the Mission Promise Neighborhood education initiative. “Our aim was to generate community involvement via fun events that would showcase impact,” explains Galindo, who was assisted in his efforts by Education Manager Laura Andersen. That impact definitely occurred, with $11,000 raised. Fundraisers were held this spring at three generously donated venues: the Mission’s Cease & Desist, which allowed their back bar to feature Mission Promise Neighborhood and John O’Connell High School guest bartenders; Senegalese restaurant Bissap Baobab, a MEDA Business Development client; and North Beach’s Cigar Bar & Grill for a Mother’s Day event. Numerous local businesses donated raffle prizes. For 2017, six O’Connell students are receiving awards after having their applications, including compelling personal histories, reviewed by committee. Recipients are all Mission students who have overcome obstacles and now want to better their futures — and that of their families — by attending college. Four of the recipients for 2017 (photo left to right, flanked by Andersen and Galindo) are Diamond Woodruff, Gisselle Ortega, Alicia Rodriguez and Maria Zaragoza. Miguel Guzman and Diana Rodriguez are not pictured. All are grateful for the benevolence of their neighbors and are now better prepared for this next step in their journey. Ortega’s story showcases the resiliency of these students. The youngster woke up at 4 a.m. each day to help her mother earn money by cleaning a pizzeria, a task that took over three hours before Ortega headed to school. She was in the first grade. “Thanks to the community for their generosity, as we send these young adults out into the world with local support from the Mission,” concludes Galindo. Special thanks to our community partners that contributed prizes to our fundraisers and provided venues to host our events: Alamo Drafthouse Cinema, Bissap Baobab, Cigar Bar & Grill, Dandelion Chocolate, Giordano Bros., Latin City Productions, Mateo’s Taqueria, Mission Cliffs, Mitchell’s Ice Cream, Roxie Theater, Tartine Bakery & Cafe and Tonic Nightlife Group. “We should focus interventions on supporting teen moms so that they stay in school. That way, we would be helping a mother and a baby have a better future, so it’s a double impact,” argued Trevor, a sophomore at John O’Connell High School, as students debated the best solutions and interventions for high school dropout prevention. The discussion was part of this week’s “College and Career Class,” when students explore their options and make sure they are on track, using the Plan Ahead curriculum. There is a growing conversation about dropout prevention, as the country is celebrating related good news. As highlighted in the December 2015 newsletter of the White House Initiative on Educational Excellence for Hispanics, Latino high school graduation is at an all-time high – 76.3 percent. While this number is still lower than the 82 percent overall graduation rate in the nation, the gap is narrowing, according to the Common Core of Data. In California, the overall graduation is now 81 percent, with 77 percent for Latinos – a lesser gap than nationwide. Working for the Mission Promise Neighborhood, Education Manager Laura Andersen has seen the challenges at John O’Connell High School first hand. These traditional barriers to a high graduation rate range from supporting a high percentage of students receiving special education services, who are from very-low-income families or who are identified as English learners. The Latino graduation rate for 2013-14 at O’Connell increased to 78 percent, higher than the national and California rate for that ethnicity. These numbers show that O’Connell’s strategy is making an impact. Various best practices combine to make this happen. Start with a 6:1 student-to-staff ratio, which demonstrates a commitment to developing strong relationships with students and the adult community. Teachers also stay with students for two academic years at a time, so as to personalize learning and maintain an atmosphere of consistency for students. Then there are the high expectations set for students, who are encouraged to pursue AP classes, honors courses and concurrent enrollment in City College of San Francisco. This abets a college-going culture at school, with community partners working to bring this environment into the home, too. This is especially important for Latino immigrant communities, with parents wanting their children to attend college, but needing assistance in how to guide the student in that direction. Across the board, O’Connell’s curriculum focuses on preparing all students for the future. They learn through an integrated curriculum, project-based learning and group work. This culminates when juniors and seniors solve real-world problems through the lab of their choice: Health Behavioral Sciences; Environmental Technology; Building, Construction and Trades; or Culinary Entrepreneurship. With an eye on the Latino graduation rate in particular, O’Connell’s Spanish-immersion program develops high levels of English and Spanish proficiency, complemented by literacy, academic competency and multicultural understanding. Those bilingual staff members also provide a consistent communication bridge with families. Such strategies will continue to make a difference over the years, with an anticipated graduation rate for Latinos – and all O’Connell students – increasing every year.